Having a party? No fear, these tools are just so easy to use with so much fun that you could gather those running kiddo for helps too. Square, round, heart, large, small, etc. whatever you throw at it will come out beautifully and professional just like those pieces at the luxurious restaurant. Now let’s look at some of best sushi making kits shall we!!! 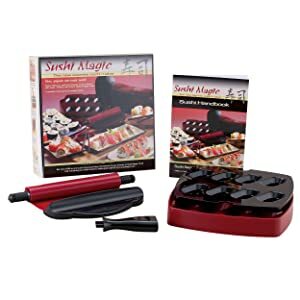 This is the most comprehensive and versatile kit of sushi making tools, that would aid and walk you through the process of making sushi from start to finish. No experience is needed, just your hands, some attention and a couple ingredients. 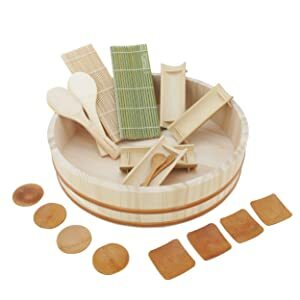 From this kit, you can make a variety types of sushi in many different shapes too. A nigiri rice mold base and cover: perfect solution for making even size nigiri base, just top up with some protein and dash of wasabi. A temaki guiding mat: do you like the hand roll, well, this is perfect for at the table sushi, just wish that they would include more than one for all the kiddo. Maki roll molds in square, round, triangle/heart shape. 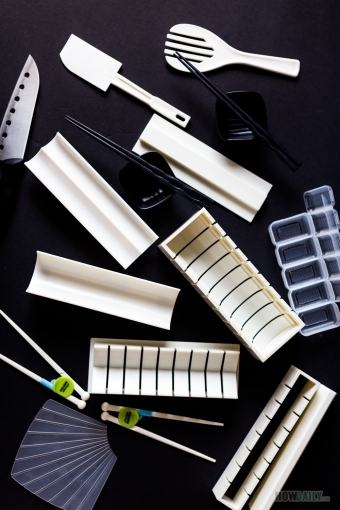 They’re also included molds to make large (futomaki) and small square mold for single ingredient rolls (hosomaki). All these molds have guide for even cutting. A nonstick sushi knife for cutting those roll into pieces. A step-by-step manual with pictures and recipes included on rolling and using the molds for making sushi. A spatula for rice spreading and serving fork. A nice string closure bag for easy storage. The best thing is all pieces in this kit are dishwasher-safe. They are made from food grade plastic that will be non-stick and can easily be wipe off. Here are some pros and cons for this kit. most of the maki molds provided is for bigger rolls, only one for small size, no medium detect. This is a nice sushi marking set that would be perfect for both the starters and somewhat novices. It contains a big wooden sushi tub (hangiri) along with a bundle of bamboo utensil, dishes, mat, etc. that bring out the Japanese zen feeling when making and serving sushi. This set is more geared toward the sushi rice aspect and also the serving sides with plates and smaller dishes. A wooden sushi rice tub (hangiri) that is used for mixing and cooling sushi rice while absorbing unwanted moisture and prevent mushy. Available in 5 sizes (10 – 15inches). However, the 15.3 inch size seem to work best, at it would allow about 10 cups of cooked rice to be mixed, which is typical for a home electric rice cooker. Choose the size the work best for your party. This is a good kit at a very reasonable price that would save you time and money compare to buying single pieces. Quality of the tub is what still need to be considered, but still, as long as you treat and season them right, they’ll work. Many would argue on buying a Japan made quality hangiri, but hey, unless you’re committed to making sushi everyday or at least so frequent enough to make it worth the $350 tub, this one is reasonable otherwise. Oh, and don’t forget to pre-season the hangiri and utensils for the first-time and before each use. Not much instruction/manual include, sushi starters have to look somewhere else for recipes and how to roll sushi, making sushi rice, etc. Unlike others, this set is focus only on making, rolling, cutting… all aspects of maki sushi rolls, from start to finish. 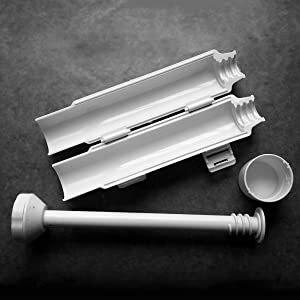 There will be no pre-fixed size mold, instead, as you walk through, you will be able to make your own roll while fully controling the size, rice and filling amount perfectly. A nonstick plastic maki sushi rolling mat that is perfect for making both the normal cylindrical sushi roll and the inside out uramaki. A clamp on training frame for sushi rice spreading guidance. 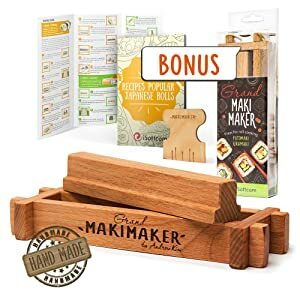 This is not just a mold, but rather a beautifully handmade wooden maki maker that designed specifically for making square shape makizushi roll. It looks so nice on the outside like a piece of art. It is solidly made and guaranty to last for a lifetime. It also comes with perfectly clear instruction w/ pictures for both square shape makizushi and uramaki too. One might wonder this would work for oshizushi, which is a type of mold pressed sushi. This is not a set, rather, a bazooka for making the perfectly round makizushi roll. The process is so simple that any one can do, just fill , close to press, shoot the whole thing out and covered with nori. 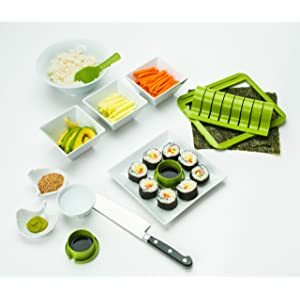 This is a fun set for mass making cylindrical sushi rolls of any size and nigiri too. It basically contains a sushi rolling device, where you lay the ingredients and with a few pull make perfectly round sushi. This device is nice to use cause you can fully control the rolls’ size and fillings amount. 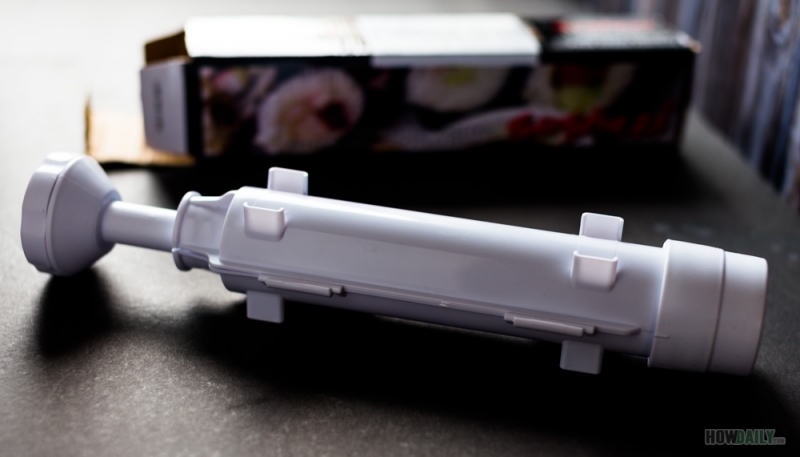 You could also do an inside-out uramaki roll with this device just as easy. 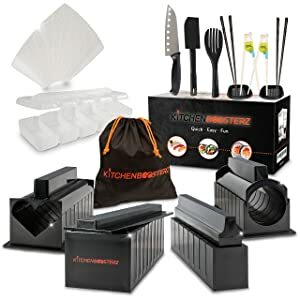 Not only that, this kit also have an unique 2-part nigiri mold set. Whereas, one part is for the base sushi rice, the other is for the topping. The two is then combine and press tightly into one perfectly looking nigiri. Those it take some practice to master this set properly, nonetheless it does help a lot in mass sushi making at home. This is not a sushi making tools but rather a combined supplies pack to make and serve sushi. All you’ve ever need to add will only be the protein and veggies. This pack would sure save you lots of time wandering around market or trips to Japanese grocery if yours local doesn’t have one. This pack is kind of nice, the kind where you just one-click shopping and get it right to your door for quick sushi. So if you in a bit of hurry, get this one, use it, mark the brand and next time whenever you’re in a local store look for those in bulk. Above are some of useful and convenient kits for making sushi. Each kit have its own advantage over the other, however they’re all on a manageable price range. 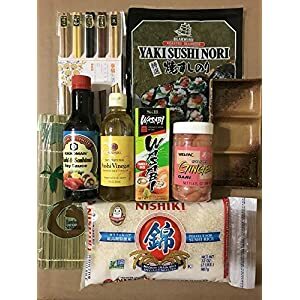 If you’re new into sushi, or only making one on occasion, then these are some good kits for you without choking out an enormous fortune. It’s required some getting uses to get a hang of the tools. They’re fun to have, and can be purchased in conjunction as each one serve a different purpose without repeat. Anyhow, have fun making sushi, get your kids to help too, it’ll be fun for them to play with the tools and making their own favorite kinds of sushi.